I am so grateful and wiggly for this!! 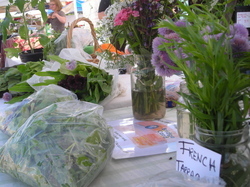 The Westside Farmers Market will start itsÂ 2011 season on Thursday, June 2. 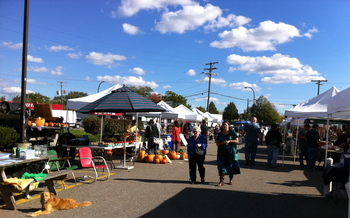 Last Thursday was the last market day of the 2010 season for the Westside Farmers' Market. We were gifted with a warm and clear day, a perfect chance to look back at the accomplishments in the market's 5th year.This was the first year we accepted Bridge Cards and Project Fresh Coupons. After we scared the bees' nest away from the Ethernet port, it became a weekly ritual to plug in the point of sale machine in order to swipe customers’ Bridge Cards and hand out wooden tokens. In September we doubled the amount of money SNAP users received thanks to Double Up Food Bucks (up to the first $20). More than $1,000 was funneled into the hands of our local farmers, in return for fresh healthy food. Martha Dopokowski, of R Farm, thought, “[The Cottage Food Bill] has really helped – even though none of these items yet are making use of my own products … that is part of my business plan.â€ Granholm signed the law into effect Monday, July 12 and by the following Thursday there were already new items joining the wares on tables. On average we welcomed 28 vendors every week in addition to non-profits, live music and free massages. Chef demonstrations were fun, often spicy, and bewitchingly spontaneous – depending on the produce of the moment. Mark Baerwolf of Cornman Farms and Zingermans Roadhouse joined us many weeks to experiment and teach. Last Thursday, gas flames roared as he blackened peppers for salsa. We welcomed an average of 890 people to the market to meet their farmer, to learn about shrimp grown in Okemos, chocolate conched in Dexter, garlic grown in Ann Arbor, Highland Beef grazing in Jackson, or popcorn grown in Clinton.Every week we recorded our bounty withÂ Real Time Farms. As our local restaurants continue to source their items locally, it is important to have as much information about the farmers and what they grow throughout the season as possible. I look forward to seeing how the website develops for our next season. Many people have asked these last few weeks why the market does not stay open for a few more weeks, to which my answer is simple. The convenience of having an open-air market in the afternoon means that by 7 p.m. last Thursday the sun had dipped behind the buildings of the Westgate Mall. Animals sleep by the sun, not the clock, as John Harnois, of Harnois farms, reminded me as we discussed the deepening dark. Unlike chickens, who put themselves to bed, he faced the prospect of chasing sleeping turkeys into the barn when he returned home. One of my favorite aspects of eating locally is the reminder of the seasons and the connection with the earth that we share with all creatures, great and small. The deepening dark allows us all to settle in for the winter. 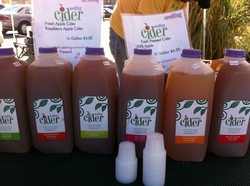 Westside Farmer Market: See you in 2011! Come one come all to the Westside Farmers Market! The morning dawned cloudy with a forecast of thunderstorms, “sometime around noon,â€ in the forecast. I looked at the sky again, and again, and again. 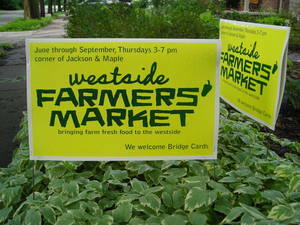 I thought to myself of all of the things I did not want to get wet at the market: Bridge Card machine, lawn signs, me. I worried that some of our new vendors would not have proper ballast for their new tents and would be blown away in gusts, product ruined, money lost. Then I shook myself, and remembered I was not in charge of the weather, and tried to change the subject. Anxiety for naught, the Universe smiled on us, the sun fought through, and there was nary a ripple of wind for the first day of the Westside Farmers Market. The numbers tell the tale beautifully. Last year the first day of the market welcomed 467 customers; Thursday there were 692 - a 48 percent increase. Last year the Roadhouse hosted 19 vendors; Thursday there were 25. Last year we did not accept Bridge Cards; Thursday (after a small shuffle with the machinery) we did. There were complimentary lawn signs available for supporters to show their support for the market and help spread the word. We had CSA pickups for Two Creeks Organics, Zilke Vegetable Farm, Pregitzer Farm Market, Down on the Farm (the Amish Community cooperative), and Our Family Farm. There were several options for cookies and baked goods: Stone Hearth Breads and Bakery, My Kitchen Gourmet (South American baked goodies), Bizzy Lizzy Bakery, and Zingerman’s Bakehouse. After filling bags with rhubarb, fresh lettuce, strawberries, onions, scapes, highland beef, fresh eggs, and pork chops - a bit of decorating was in order. Nancy Melet’s hand-linked silver jewelry sparkled in the fighting sun. Also available to titillate the external senses was Nakee Natural handcrafted soap and skincare; her collection is made from organic, unrefined, all fairly traded ingredients - and her whole tent smelled like a florist shop. For a full list of the bounty and variety of the first day check out the market report on Real Time Farms. I watched Karl and Cara Rosaen for more than an hour at the market, speaking to every vendor to be able to accurately record what they offered to sell and taking pictures as well. Cara shared with me that the response to their website has been overwhelming, new markets are recorded on the site every week from over the country - from Connecticut to California. I think this is a great comment on the vitality of our farmers’ market community. To these sentiments, I add my own - thank you, Universe, for the sun. Interviewed on the radio for the Westside Farmers Market! That's right! I sat down with Kim Bayer, Rachel Chadderdon, and Jeffery Green Bean (I am hazarding a guess that is not the name he was born with) on WCBN.org/88.3 FMÂ on Arborama and we talked about the Westside Farmers Market. Here is the podcast so you can hear as well (my segment is the last 22 minutes). It was very surreal talking into a microphone with a big headset on, knowing that every "um", cough, and "like" is being recorded for eternal posterity. And there were a few "ummms" - especially when I was asked about the Cottage Bill. Ah well, I will doÂ better next time.